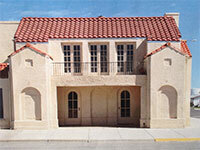 The Town of Sinclair is in the planning stage of renovating our Historic Theater. We will be applying for grants to help fund this major project and we are accepting charitable contributions to help with the Town's matching funds. We can provide a tax deductible receipt to those that donate to the Town. Website Designed by Wyoming Network Inc.